SCVHistory.com LW3291 | Film-Arts | Arcade Card: Buzz Barton Stars in 'The Little Buckaroo,' 1928. 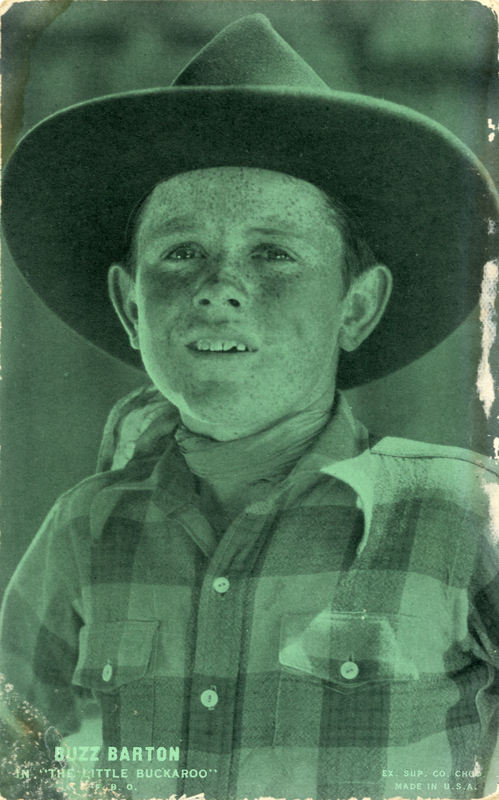 Buzz Barton in "The Little Buckaroo"
Arcade card advertises Newhall resident and child actor Buzz Barton (real name William A. Lamoreaux) playing the title role in "The Little Buckaroo" from FBO, 1928. Back is blank. Standard references list 1927 as the year of issuance for this variety of collector card from Exhibit Supply Co. of Chicago — light green with "EX. SUP. CO. CHGO. / MADE IN U.S.A." at lower right. 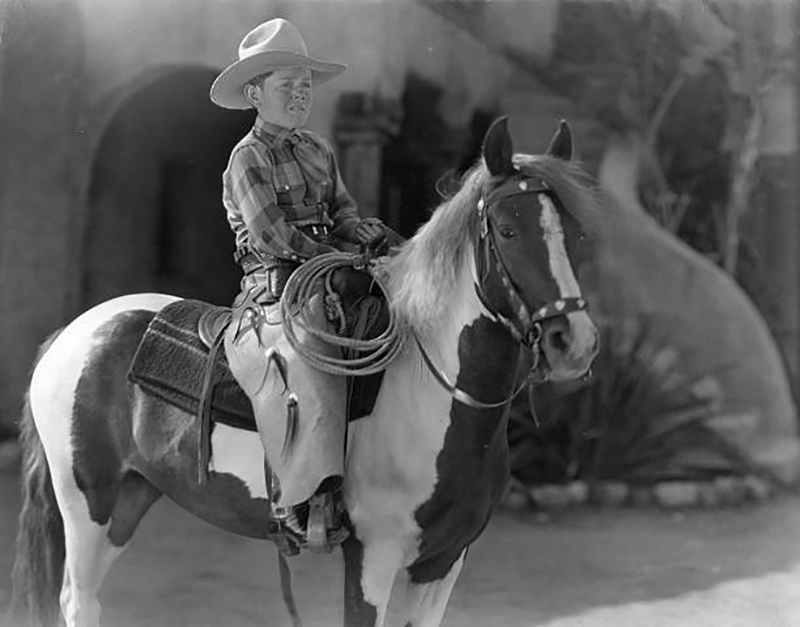 But "The Little Buckaroo" premiered in theaters February 25, 1928, so this style obviously outlasted the end of 1927. 1927 was a significant year for Lamoreaux: It's the year he left one poverty-row studio (Rayart) for another (FBO/Film Booking Offices of America). At Rayart he played supporting roles as Billy Lamar; FBO gave him the catchier moniker and starring roles — at least until he physically outgrew his ability to play a youth. We don't know where "The Little Buckaroo" was filmed, but it was produced by Robert N. Bradbury, who would make films all over the Santa Clarita Valley in the early 1930s (especially in Placerita Canyon and Vasquez Rocks), usually starring his own son, Bob Steele, or his son's old high school buddy, John Wayne. "The Little Buckaroo" is directed by Louis King from a story by Frank Howard Clark (scenario by Oliver Drake). It also features Milburn Morante, Peggy Shaw, Kenneth MacDonald, Al Ferguson, Walter Maly, Bob Burns, Florence Lee and Jim Welch. William Andrew "Red" Lamoreaux was born September 3, 1913, in Gallatin, Missouri. He was just a boy when his family moved to Newhall, where he met Western actor Jack Perrin and stockman Andy Jauregui. One or the other of them, depending on the source (Jauregui locally, Perrin elsewhere), got him into the movies at age 11. His first screen appearance was a small, uncredited role in the Jack Perrin vehicle, "The Knockout Kid." It premiered September 1, 1925, just shy of Lamoreaux's 12th birthday. It was produced by W. Ray Johnston, who would go on to become one half of the Monogram operation with Trem Carr and would eventually become a Newhall resident himself. Lamoreaux's next appearance earned him a screen credit as Billy Lamar, the name Johnston's company, Rayart, gave him. His name changed when he left Rayart in 1927 for FBO, where director Louis King gave him the title role in "The Boy Rider." 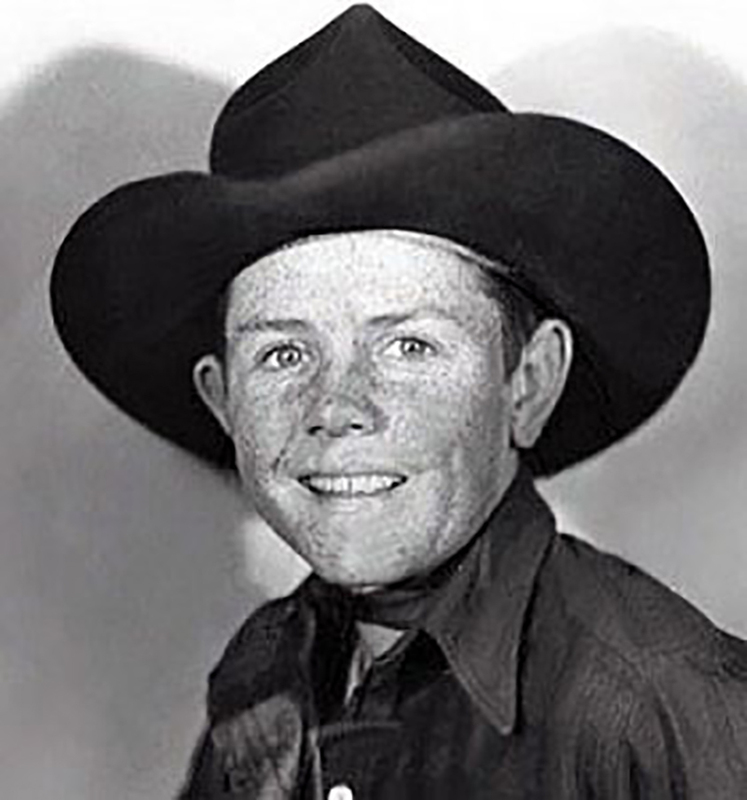 Now this freckle-faced kid was "Buzz Barton," and the name stuck. Adept with a rope, he lived up to his nickname, "The Boy Wonder of Westerns." Unless you're Mickey Rooney, being typecast as a youth doesn't last. Puberty took its toll, and the advent of "talkies" hastened the process. Lamoreaux might have gotten away with looking like a young teenager for a few more years — he stopped growing at 5-foot-2 — but he didn't sound like one. The roles got harder to come by. He played supporting roles in the late 1920s and '30s and even co-starred opposite Yakima Canutt in 1930's "Canyon Hawks," which used Mystery Mesa in Saugus as a filming location. That same year he co-starred with Rin-Tin-Tin in the 12-chapter Mascot serial, "The Lone Defender." He was still popular enough that the Daisy Co. marketed a Buzz Barton Special Daisy Air Rifle, as it did with Buck Jones. Lamoreaux would appear in dozens more B-westerns ... with fewer and fewer screen credits as time wore on ... many of which were filmed in Santa Clarita Valley, such as 1935's "Powdersmoke Range" with Harry Carey and Hoot Gibson. When the United States entered World War II, Lamoreaux traded in his spurs for a sailor's uniform. He was a member of the crew of the USS Missouri when Japanese goverment officials signed the surrender documents on the deck of the ship September 2, 1945. On June 22, 1947, he married Thelma Doyle, and Saugus denizen William G. Bonelli put him to work running one of his ranches in Arizona. The couple returned in 1956 with their daughter Linda and moved into a one-bedroom home in Newhall at 24753 Valley Street. He worked as a top wrangler in the movies at the Randall Ranch in Newhall until he retired for good in 1979. Lamoreaux moved to the San Fernando Valley, where he died November 20, 1980. His body was returned to Newhall for burial in the Garden of Memory at Eternal Valley Cemetery. LW3291: 9600 dpi jpeg from original arcade card purchased 2018 by Leon Worden.